I got up early this morning and checked Craigslist for any yard sales happening today within walking distance of my house. I found an estate sale and scored two bags full worth of stuff there. 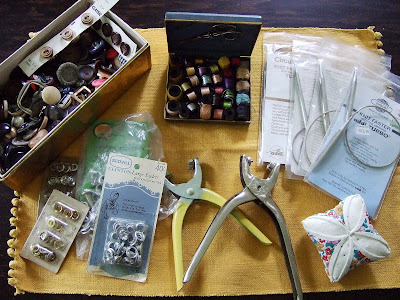 Buttons, a vintage Belding-Corticelli kit, Addi Turbos, eyelets, snaps & associated tools, and a pincushion! Everything was 50 cents each except the box of buttons which was $3. I'll ask my mom if she wants any of the knitting needles, she knits a lot more than I do. I also got some kitchen gadgets, vintage Italian silver spoons, colored pencils and some old coins that I'll send to my dad who is a collector. I decided to skip the rest of the yard sales on my list except for one that was on my way home. 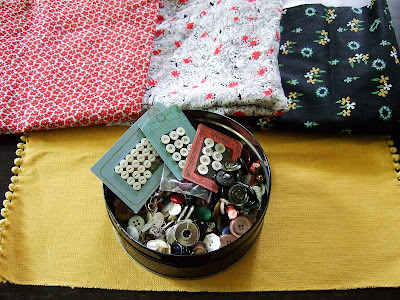 More buttons(!) and fabric (because I just don't have enough). Speaking of bargains, my mom sent me this Balmain pattern that she found at a thrift store (in Colorado which is where my parents live). Factory folds, and it even has the special Vogue label! I've only been to one estate sale and it was amazing! 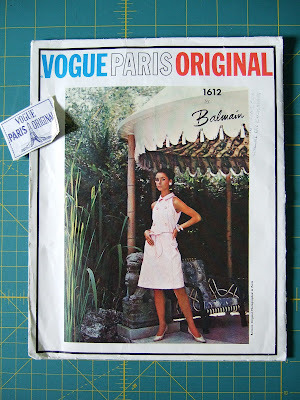 I picked up a Vogue Special pattern still in its factory folds and both special labels included--I didn't even know about these labels until I took it home. However, it sat and sat, so I gave it all to a friend who also loves vintage patterns, but I kept the other label for myself. I hope that you get to sew your pattern and attach that special label too! You have some very cool finds there!!! Very fun!! Love the pattern! Congrats on your fun finds! Ooooh, that looks like a great haul! Sounds like you had a good time. I didn't know you could use Craigslist to find estate sales, that sure beats my method of aimlessly driving around. Love the pattern ~ what a great find! Enjoy all the goodies! What fun! I have the same Belding/Corticelli thread box. First time I'd ever seen thread double-wrapped on a spool. Mine was from a garage sale. Enjoy!